The century of Hitler, Stalin and Pol Pot, the era of mass murder, mass abortion and mass breakdown of relationships, this century of state-imposed or culture-supported atheism, has shown there is every cause for angst if people give up on God. Totalitarian rule in the 20th century was devastating. But Fisher's statement is misleading and dishonest. For one, the most notorious dictator, Hitler, a self-described Catholic, endorsed religion as foundation of society, claimed publicly to do Gods work, banned free-thinking organisations, persecuted their leaders, while German soldiers wore the inscription ''God with us''. In return, Catholic bishops called to support the regime, took an oath of loyalty, and rung the bells to celebrate a failed assassination. Surely, Hitler's ideology was racist, not religious, informed by an unholy mix of social Darwinism, nationalism, and centuries of church sanctioned anti-Semitism. Fisher might have also forgotten Catholic support for totalitarian regimes, like Franco's Spain, or for their members, like Pinochet. Totalitarian rule of the 20th century shows what happens if critical thought and free speech is given up in favour of dogma and ideology. Fisher's statement is not only demeaning to atheists who fought totalitarianism. Many courageous religious people, of all denominations, Catholics included, stood up and defended the rights and freedoms of others. George Santayana famously warned "The one who does not remember history is bound to live through it again." The many excellent government agencies are religiously neutral, secular and not anti-God, paid for largely by the taxes of the Christian majority. We thank God for them too. But we find no community services sponsored by the atheists. 26% of Australians are Catholics, 19% Anglicans, and 19% have no religion, according to the 2006 census. They all pay taxes, it is not a religious priviledge. Quite the opposite, actually. Religious organisations in Australia are tax-exempt. Not just activities that benefit the community, fight poverty, and promote education - which we support - but also activities that promote religion, or are ordinary business. As atheists we would love not to subsidise the Catholic Church to manage their 100bn worth of wealth. We would rather give our taxes to one of the many secular charities that we already donate to. Like Amnesty International, Doctors without Border, the Red Cross, or Oxfam. 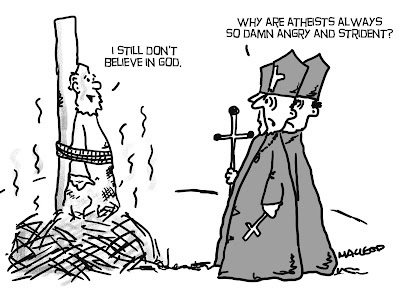 As we can see by the sheer passion and virulence of the atheist - they seem to hate the Christian God - we are not dealing here with cool philosophy up against faith without a brain. Atheism is disbelief in gods, and reasons are plenty. Like the fact that religious claims are unproven, absurd, contradictory or vacuous. As such, it is cool philosophy. Atheists, however, are passionate people. They get passionate when a bishop protects a child abuser. When a religious school suspends a student for being gay. When Christian lobbyists deny children of non-religious parents an alternative to scripture class. Atheists get passionate when civil liberties get undermined for a tax-payer subsidised religious youth event. When religions demand the right to discriminate women, gays, and people of other or no faith. When they oppress women. When religions ask not to be criticised because of their religion. We are passionate, because rather than caring for a god, who might not exist, we care for humans, who do.